FBS, an international Forex broker, regulated by the prominent IFSC and CySEC authorities, is now offering a unique Loyalty Program to all its registered clients. This program is a show of appreciation to the devoted clients of FBS who can receive real gifts by earning Prize Points. The gifts are granted in various forms from hi-tech gadgets to Mercedes S-class! The traders are obviously required to trade with FBS, and the partners should attract their clients to trade with the broker to earn points. When you excel in the program and get higher status points, you’ll make your way to the next Loyalty statuses. Plus you can exchange your earned Prize Points for gifts. Pretty cool, huh! Now you might wonder if there is a way to exchange your earned Prize Points for gifts, well you’re in luck! When you prosper in trading and acquire yourself Prize Points, this would entitle you to receive topnotch prizes as well as VIP services! If you activate the “Cash for Points” option, you can receive real money for your prize points (1 Prize point = 1 USD). Furthermore, withdrawals can be made to all the available payment methods. 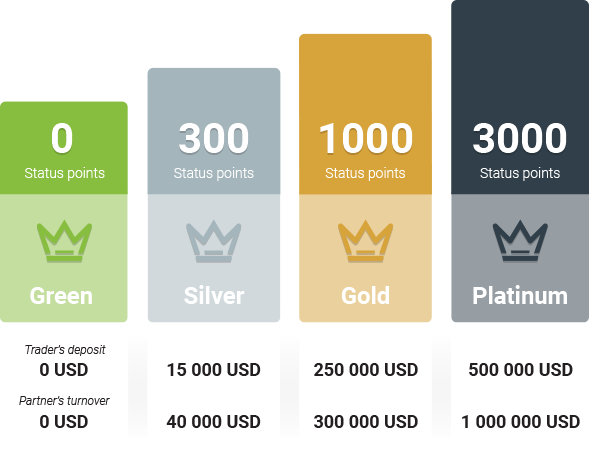 Green Status Prizes (0 Status Points): this level is set by default, and its gifts include cash for points, private coaching session, VPS-server, and FBS lucky souvenir collection. Silver Status Prizes and VIP Services (300 Status Points): the required deposit for this level is 15,000$ (40,000$ for partners), and its gifts include iPhone X 256GB, Samsung Galaxy s9+256GB, Samsung Tab S3 32GB, high priority deposit and withdrawal processing, and high priority customer requests via online chat. Gold Status Prizes and VIP Services (1000 Status Points): the required deposit for this level is 250,000$ (300,000$ for partners), and its gifts include MacBook Air 13” 256GB, iMac Pro 27” 32GB, Rolex Submariner, personal manager, and exclusive Birthday as well as New Year gifts. Platinum Status Prizes and VIP Services (3000 Status Points): the required deposit for this level is 500,000$ (1,000,000$ for partners), and the gifts include Mercedes S-Class, Rolex Yacht-Master Gold, a trip to FBS headquarters, and VIP event invitation. For more info on coefficients or other details of the program, please read the T&Cs in depth. Now that you know about the statuses of the program, it’s time to know how you can get a higher position. It’s pretty straightforward; you just need to add more deposit to your trading account (client’s turnover for partners) to earn status points. When you go to the next level, you’ll get access to better and more expensive gifts. In this way, you’ll add to your prize points’ coefficient and therefore receive more rewards. Go to your personal area on the FBS official website, confirm your email address, provide proof of identity, and join the loyalty program. When you are officially a member of the loyalty program, you just need to upgrade your way to the top and receive the most rewarding prizes that this program has to offer! This program is offered to all the confirmed clients. Once you join the program and receive the green status, you cannot cancel it. Only closed orders (with no less than 59 points) are considered valid. An active trading day is the one in which at least one order is closed. When you upgrade to the next status, your previous status points will be canceled. Trading with bonus funds does not entitle you to receive prize points. The clients are allowed to do internal transfers. The Prize Points will remain valid for one year. Earning more prize points, entitles you to get to the higher statuses of the program. The more deposits you make, the higher your chances are of receiving better gifts. Get FBS Loyalty Program Now!